The George W. Bush administration’s ambitious—even breathtaking—claims of unilateral executive authority raised deep concerns among constitutional scholars, civil libertarians, and ordinary citizens alike. But Bush’s attempts to assert his power are only the culmination of a near-thirty-year assault on the basic checks and balances of the U.S. government—a battle waged by presidents of both parties, and one that, as Peter M. Shane warns in Madison’s Nightmare, threatens to utterly subvert the founders’ vision of representative government. Tracing this tendency back to the first Reagan administration, Shane shows how this era of "aggressive presidentialism" has seen presidents exerting ever more control over nearly every arena of policy, from military affairs and national security to domestic programs. Driven by political ambition and a growing culture of entitlement in the executive branch—and abetted by a complaisant Congress, riven by partisanship—this presidential aggrandizement has too often undermined wise policy making and led to shallow, ideological, and sometimes outright lawless decisions. The solution, Shane argues, will require a multipronged program of reform, including both specific changes in government practice and broader institutional changes aimed at supporting a renewed culture of government accountability. 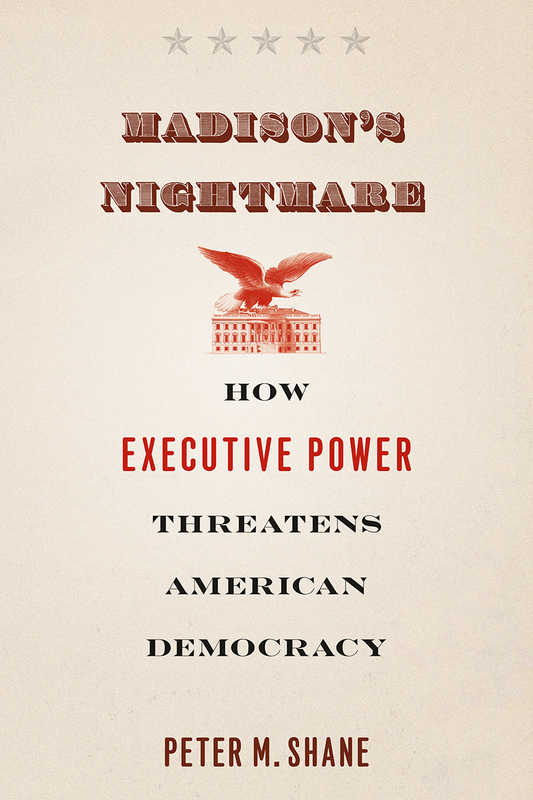 From the war on science to the mismanaged war on terror, Madison’s Nightmare outlines the disastrous consequences of the unchecked executive—and issues a stern wake-up call to all who care about the fate of our long democratic experiment. "As presidential authority expands, and the role of Congress diminishes, the American people continue to lose control over their government. Today’s assertions of executive power are indeed a nightmare and Peter Shane’s extremely readable and well-informed book describes this disturbing transformation in frightening detail. For anybody who cares about our constitutional system of protected liberties, this book is indispensable. I couldn’t put it down and grew angrier, and more concerned, with every page." "Peter Shane argues that post-1981 presidentialism is the enemy of the kind of deliberative governance that our founders intended. He shows how the Bush Administration’s vision of the "unilateral" Presidency—the reductio ad absurdum of presidentialism—not only misinterpreted the Constitution, but failed as a philosophy and strategy of government for meeting the nation’s needs. Shane goes well beyond bashing the last Administration, however. He explains how, if our government is to give us real solutions to our hard problems, the members of every Administration, as well as Congress and the judiciary need to re-read the Constitution and take critical steps to reshape our legal culture in order to resuscitate public accountability and the principle of checks and balances. But, first, they need to read this book." "Since the Obama administration now has czars for cars, information technology, bonuses, financial products, etc., can a book czar be far behind? Well, here’s a memo for the inbox of our book czar to-be. It’s about a slender volume that I want our new czar to mandate as a ’must-read’ for every American from middle school to grad school and way beyond. The book is titled Madison’s Nightmare." "Shane writes here about the enormous expansion of presidential power and its violation of constitutional principles. In particular, he argues that the rise in presidential power is contrary to the intentions of the framers, who imagined a restrained executive subject to the checks and balances of Congress and the judiciary. In modern history, the author argues, we have seen the rise of an aggressive presidency that too often ignores the will of Congress, which has led to bad decision making and illegal acts. Shane calls this ’presidentialism’ and explores this theme throughout the book, giving examples of unrestrained presidential power, such as the Terrorist Surveillance Program of George W. Bush and the conduct of the Iraq War. Although he draws notable examples from the recent Bush administration, Shane is careful to say that many Presidents have been guilty of presidentialism; he traces the concept back to the New Deal and cites Watergate as a notorious instance. Later chapters offer solutions to the problem of expanding presidential power, e.g., election reform and increased access to broadband Internet. Recommended for academic and large public libraries." "Peter Shane’s book is a welcome contribution on the antimonarchist side. . . . This is an impressive book in the scope of questions addressed, the materials–both legal and political science–drawn upon, and the clarity and cogency of its thinking. It would be a valuable enhancement to courses on the presidency, constitutional theory, or public administration."